Traditional pesto sauce is a blend of basil, olive oil, pine nuts, garlic, Parmesan and Pecorino cheeses. It originated in Liguria, Italy and was initially used to flavor vegetable soups, and wasn't used on pasta until 1910. Pesto sauce is higher in calories than marinara sauce, but is a good source of monounsaturated fats. 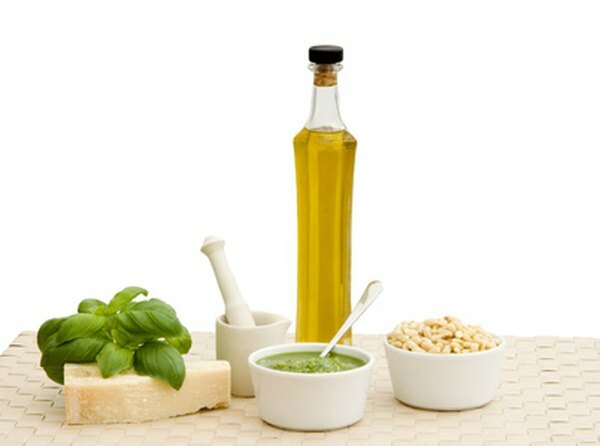 Knowing the nutrition information for pesto sauce can help you adjust your intake to include it in your diet. A traditional, commercially-available basil pesto contains 230 calories in a 1/4-cup serving. A homemade basil pesto recipe that includes walnuts instead of pine nuts contains 166 calories in a 1/4-cup serving. Pay attention to serving size when you're serving pesto -- a quarter-cup serving goes a long way, but loading your plate up with pesto can quickly boost your calorie intake, and cause overeating that contributes to weight gain. Basil pesto is a high fat food item, but most of its fat is monounsaturated fat from the olive oil. One serving of commercial basil pesto contains 21 g of total fat and 3 g of saturated fat. One serving of homemade basil pesto contains 16 g of total fat, 2 g of saturated fat and 10 g of monounsaturated fat. The American Heart Association recommends a heart-healthy diet contain 25 to 35 percent of its calories from fat with the majority of those calories coming from monounsaturated and polyunsaturated fats. Including more monounsaturated fat in place of trans and saturated fat can help lower blood cholesterol levels. Pesto sauce is not a significant source of carbohydrates or protein. One serving of commercial basil pesto contains 6 g of carbohydrates, 1 g of fiber and 0 g of protein. A 1/4-cup serving of homemade basil pesto contains 2 g of carbohydrates, 2 g of fiber and 4 g of protein. Carbohydrates in food provide your body with energy, while protein supports your immune system and helps to rebuild tissue. A healthy diet should contain 45 to 65 percent of its calories from carbohydrates and 10 to 35 percent of its calories from protein, says the McKinley Health Center. A 1/4-cup serving of commercial basil pesto contains 720 mg of sodium, and a 1/4-cup serving of homemade basil pesto contains 352 mg of sodium. The USDA dietary guidelines recommend you limit your intake of sodium to less than 2,300 milligrams a day. High intakes of sodium cause your body to retain fluids, which can increase your blood pressure. One serving of the commercial pesto contains more than 30 percent of your daily sodium limit.